It is a 2in1 Volt Amp Panel Meter, Measure Voltage Range DC 0-300V,Measure Current Range 0-5A forwar.. It is a Red Yellow LED DC 33.0V 1A Digital Voltmeter Ammeter,Voltmeter Range: DC 0-33.0V,Ammeter Ran.. It is a 2in1 Volt Amp Panel Meter, Power Supply: DC 4.5-30V,Measure Voltage Range DC 4.5-30V,Measure.. It is a Digital Ammeter ,Voltage Range DC 3.5-30V, Current Range DC 0-3.0000A, It has Anti-reverse p.. It is a 2in1 Volt Amp Panel Meter, Measure Voltage Range DC 0-100V,Measure Current Range 0-100A (req.. 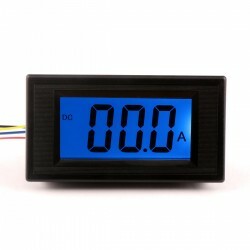 It is a Red/Yellow/Blue/Green LED Digital Ammeter,Power Supply DC 7-30V,Measuring Range DC 0-10A, It.. It is a DC Ammeter/Digital Meter/Ampere Meter/Tester, Power Supply: DC 7~30V, Measuring Current Rang.. It is a Digital Ammeter/Ampere Meter, Operating voltage: DC +5 V +/- 0.5, Measure Current Range: 0~5.. It is a DC Analog Ammeter,Measuring Range:DC 0-100mA,The basic error: + - 2.5%,Damping response time.. It is a DC Analog Ammeter,Measuring Range:DC 0-200mA,The basic error: + - 2.5%,Damping response time..
0.56" Red/Blue/Green LED Digital Ammeter. Small dimension, Measuring Range: DC 0-50.0A ,Application:.. It is a Digital Current Meter/Digital Meter/Panel Meter/Tester, Measuring Current Range: DC 0~9.99A,.. It is a Digital Ammeter/Amperemeter/Tester, Measuring Current Range: 0~49.9A, Power Supply Voltage: ..